Smithing can be one of the most profitable and useful skills in RuneScape, but is also one of the hardest and most expensive to train. Only players who are dedicated and determined will succeed in this skill on their own. This guide will help you through the levels, and towards the famed Smithing Cape of Achievement. Good Luck! Smithing is one of few skills that use other skills to aid them. With these skills, training Smithing becomes considerably easier. One of the biggest aids Smithing has is Mining. Mining ores yourself can reduce costs by millions in the later levels, but greatly increases the amount of time each stage will take. Magic can also greatly assist you with Smithing, but can increase the price. Using the 'Superheat Item' and 'High Level Alchemy' spells can be a quick way of smelting bars and selling them or selling items after you have smithed them. So, you want to train Smithing quickly? Well before you start, keep in mind that these methods will cost a lot of money. Note: All prices in this guide are estimations, and are taken from the Grand Exchange. Prices may fluctuate over time, causing the totals to change. The best (and only) way to advance to Level 15 is by smelting Bronze bars. Getting Copper and Tin ores is simple enough. Just buy around 390 Copper and Tin ores from the Grand Exchange and smelt them all into bronze bars. The fastest way to do this is by using the 'Superheat Item' spell, which requires a Magic level of 43 to use. 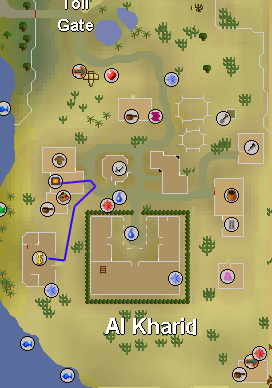 If you can't use this spell, the fastest way is by using the Al-Kharid furnace if you are a freeplayer, or by using the Port Phasmatys furnace if you are a member. To use the Port Phasmatys furnace, you must have completed the Priest in Peril Quest. Unless you have completed the Ghosts Ahoy Quest, you will need to pay a fee of 15 ecto-tokens to enter Port Phasmatys. The furnace in Neitiznot is also a very good place to smelt, but is only recommended for players who have completed the 'Fremennik Isles' Quest. Alternatively, if you have completed all easy-difficulty Varrock Tasks, you can use the Edgeville furnace. If you don't meet any of these requirements, the Al-Kharid furnace will do. The fastest way to level up now is to simply do the Knight's Sword Quest. Completion of this quest awards you 12,750 Smithing experience, boosting your Smithing level to 31! Now that you are past level 30 Smithing, you can begin making Steel hatchets. Although this is a lot more expensive than either of the previous methods, it is the fastest. If you want, sell all of the hatchets you make to get some money back. When smithing, the anvil in Varrock near to the west bank is easily the best place. To reach level 48, you will need to buy about 1,800 Steel bars and smith them all into hatchets. The easiest and quickest way to train Smithing now is to smith Steel Platebodies (unless you are a member who has completed the 'Family Crest' quest). Yet again, this is expensive but very quick. You can make about a quarter of the money you spend back if you sell the platebodies that you make. The total number of platebodies that you need to make is 3,492. Don't forget that platebodies use 5 bars each. If you have completed the 'Family Crest' quest, and have the Goldsmith Gauntlets, then you get more experience whilst smelting gold bars. This makes smelting gold a quick and efficient way of reaching level 70 Smithing. The 'Superheat Item' spell is very useful for this method, but the amount of Nature Runes you would need to but makes it more costly. To reach level 70 Smithing, you will need to smelt 11,648 pieces of Gold Ore into bars while wearing the Goldsmith Gauntlets. 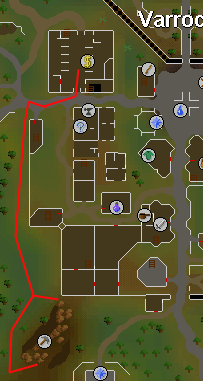 The best place to smelt Gold Bars is Edgeville, as the furnace is close to the bank and you randomly smelt two ores at one, but bear in mind that you must have completed all easy-difficulty Varrock Tasks to use the Edgeville furnace. Well done, you are now able to smelt and smith Adamantine! Giving almost 63 experience per item, smithing Adamant Daggers is the way to go. Although extremely costly, smithing Adamanting daggers is the quickest way for both members and freeplayers to advance to level 85 Smithing. Try not to be put off by this, but you need to smith a total of 40,336 Adamant daggers to continue to the next method. Just one more step until you can finally be the proud owner of the Smithing Skillcape. Now you can smith Rune items, but too keep the cost from going too high, it is advised not to smith rune items, as it would cost over 1,000,000,000 coins. The best item to smith to reach level 99 is Mithril Platebodies. You will need to smith 39,104 of these, costing a staggering 200 million coins. Congratulations, you are now one of the best smiths in RuneScape! Reaching level 99 Smithing is not a feat to be taken lightly, but you prevailed! Well Done! Don't feel like you have enough money to follow the quick route? Or do you just want to make some cash while training your skills at the same time? Whatever the reason, this guide will show you how to reach level 99 Smithing spending the least amount of money you possibly can. This is almost the same as the quick route, just without buying the ore. There a three mines around Varrock alone where you can mine copper and tin ore, and another in Lumbridge Swamp. 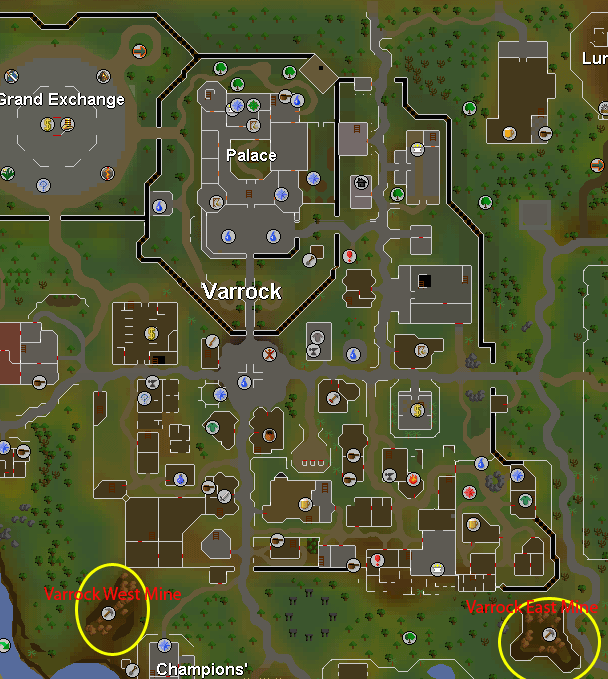 The recommended mines are shown on the map below, on the south-east and south-west sides of Varrock. After mining and banking about 390 of each ore, you need to smelt the ores into bars. So empty your inventory, withdraw 14 copper ore and 14 tin ore, and head over to a furnace. 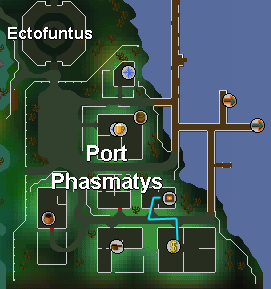 The best furnace located in Port Phasmatys, but is members-only and requires the 'Priest in Peril' quest to be completed before you can enter Morytania. 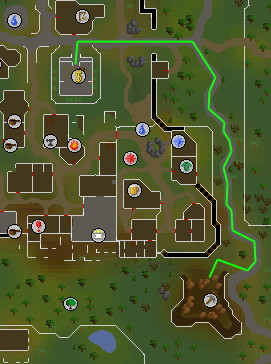 Edgeville furnace is the best location for freeplayers, but requires completion of all easy-difficulty Varrock Tasks. If you don't meet any of these requirements, then the furnace in Al-Kharid will suffice. After you have smelted all the bars, you can sell them at the Grand Exchange near Varrock. Yet again, the best possible method for training these levels is by completing the 'Knight's Sword' quest, as it gives a massive amount of smithing experience. Note: This method is for starting the cannonball route. If you don't intend on following this method, skip to the 'Levels 31 - 48' Method. To gain these four short levels, you will make steel bars. You will only need to make around 200 bars, so mine 200 iron ore and 400 coal and bank them. The best place to mine these are in the Mining Guild. If you don't have access to the guild, then just use the dwarven mine that's next to it. Then, use the furnace you used in the first step to smelt all the ores into bars. Although extremely slow, this will bring you massive amounts of money. First you will need to smelt steel bars as you did in the previous step, but instead of selling them, you will use them on a furnace with a cannonball mould in your inventory to turn them into cannonballs. To reach this level 48 Smithing, you will need to smelt Steel bars. These require 1 Iron ore and 2 Coal, making the Mining Guild the best place to mine them. The dwarven mines next to it is a very good place to collect the ores required as well. This next few levels are where the going really does get tough, so be warned, this is not for people who give up easily. But for those of you who decide to go ahead with this method, you will be smithing Steel Platebodies. You will need to smith 17,460 Steel bars to complete this step. The anvil opposite the Varrock west bank is easily the best place to smith. Note: These next steps require you to have a high mining level to make money. If you don't have a mining level past 70, follow the previous step to reach level 99 Smithing. Now you can really start to make some money. Adamant bars are worth over 2,000gp each, meaning you can make some serious money from them. You will need to smelt 67,226 Adamant bars to reach level 85 Smithing. Note: These next steps require you to have a high mining level to make money. If you don't have a mining level past 85, follow the previous step to reach level 99 Smithing. Just one more step to go, then you can be a very rich player with level 99 Smithing and the Smithing Skillcape. Successfully completing this step will make you one of the richest people in RuneScape. To reach level 99 Smithing, you will need to make 195,517 Runite bars. Congratulations! After such hard work, you are now one of the best smiths in RuneScape, and also one of the richest players! Well Done! So, you want to train your Smithing skill, but don't have much money and don't want to spend a long time earning money? Well, there is one simple method that can help you do just that. In the previous two sections, I have explained how to earn money whilst training Smithing, and also how to train Smithing in the fastest possible way. All you need to do is combine the two. For example, for Levels 1 - 15, follow the 'Making Money' section. But for the next section, follow the 'Full Speed Ahead!' section, cutting down the time spent. If you find yourself losing money, then you can simply half complete the level set follow the 'Money Making' section, and complete the rest following the 'Full Speed Ahead!' section. If you decide to follow the 'Making Money' section, using Mining to aid with Smithing is inevitable. The two skills fit together perfectly, and are often used together by new players, or higher-leveled players who are trying to earn money. Mining can help save a lot of money in Smithing, because it eliminates the need to buy any ores or bars at all! The best place for both freeplayers and members to use these skill together is Falador. By using the Mining Guild there, bank the ore. Then withdraw the ore when you have the amount that you want, and use the furnace just east of the bank. The withdraw a hammer when all the ores have been smelted and smith them into items at Doric's anvil. Smithing and Thieving are commonly used together. Thieving doesn't really help Smithing at all, but can be useful for making items. For example, if you wanted to make a tiara, you could thieve the mould from a crafting stall, and thieve the silver bars from a silver stall. This isn't very commonly used, because it isn't very useful for making money or training either skill. If you have seen the 'Full Speed Ahead' section, then you may have an idea of which spells can be used with Smithing. 'Superheat Item' comes in very useful if you have a lot of money. The ability to smelt items without going to a furnace speeds up training by a lot, and can be used with Mining as well. 'High-level Alchemy' is also a very useful spell, and can save valuable bank space if you are freeplay. As with 'Superheat Item', this spell can be used with Mining. 'Enchant' spells can also be used with jewelry you have smithed to make enchanted items. Although not very useful for training, Crafting is used with Smithing a lot. You can make tiaras, rings, necklaces, amulets and bracelets. You can encrust these items with cut gems by carrying them in your inventory when you make the item. For example, to make Sapphire Necklace, you would carry 1 gold bar, a cut sapphire and a necklace mould. Then you would use the gold bar on the furnace, and select 'Sapphire Necklace' from the menu that appears. To make it into a Games Necklace, you would need to use the 'Level-1 Enchant' spell on it. Doric's Quest -- This quest doesn't give Smithing experience, but allows you to use Doric's anvil, which is north of Falador and east of Taverly. These are a rare drop that can only be obtained in a PvP world or Bounty Hunter world. While wielding these, you get four times the amount of experience that you normally would, but only when you are in the Wilderness. Using these with the Sacred Clay hammer can give you eight times more experience that normal. A Sacred Clay hammer can only be obtained by transforming a morphic tool into a Sacred Clay item. Although they have limited charges, they give twice the amount of experience that you would normally receive for Smithing. The morphic tool can only be obtained by trading points from the 'Stealing Creation' Activity.